↑ "Cuba: Fidel Castro's son 'takes own life'". BBC News. 1 February 2018. ↑ 3.0 3.1 3.2 "Visiting Russia, Fidel Castro's Son Scoffs at U.S. Sanctions Over Crimea". The Moscow Times. April 1, 2014. ↑ ""Fidelito" ist tot". DPA-Article in Der Tagesspiegel. February 2, 2018. ↑ Stone, Richard (2 February 2018). 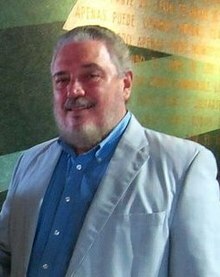 "Fidel Castro's eldest son, a physicist, is victim of apparent suicide". Science. ↑ "Se suicida Fidel Castro Díaz-Balart, hijo mayor del expresidente de Cuba". BBC Mundo. 2 February 2018. ↑ Rodriguez, Andrea (February 2, 2018). "Fidel Castro's son mourned in Cuba after suicide". ABC News. （原先內容喺2018年2月5號歸檔）. 喺2018年2月5號搵到.